NASA astronaut Karen Nyberg is launching on a six-month mission to the International Space Station this month, so she's making sure to savor this Mother's Day with her 3-year-old son and her husband, who also happens to be an astronaut. Nyberg and her husband, NASA astronaut Doug Hurley, are in Moscow for Mother's Day and she described the challenges of balancing life as astronaut and a mom to Parenting Magazine while counting down to a May 28 launch to the International Space Station. "The longest I've been away from him at this point is about five weeks. He's 3 years old, so it's really hard to tell exactly what he understands," Nyberg told Parenting magazine. "But we do tell him that mommy is going to live on the space station. Nyberg told Parenting magazine that her plans for Mother's Day include relaxing with her family in Russia, where she has been completing final preparations, exams and simulations for her role on Expedition 36/37. On May 28, a Russian Soyuz spacecraft is scheduled to take Nyberg and two crewmates from the Baikonur Cosmodrome in Kazakhstan to their temporary home, more than 200 miles (320 kilometers) above Earth's surface. While the Internet, weekly video conferences and an Internet protocol telephone help International Space Station crews stay in touch with family and friends on Earth, all astronauts who have logged long weeks in orbit deal with leaving loved ones back home. Many have talked about how they prepare for their separation. "You want to make sure that your family is involved with that adventure you're about to have — that experience you're about to have," Nicole Stott, who has logged more than 100 days in space, said in a recent NASA video. Nyberg has been doing just that. She admits it has been hard to tell what her 3-year-old really understands, be he knows his mom is headed to the space station. She also told Parenting magazine that she's looking forward to sending him videos and showing him what everyday tasks look like on the space station — that is, when she's not taking part in one of the 200 science experiments that are planned for her mission. 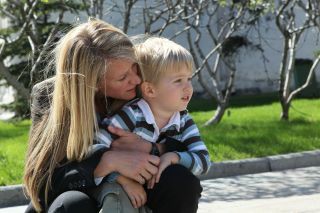 Nyberg said she grappled with the idea of spending six months away from her son. "But after going through it in my head for a long time, this is a dream I had since I was a young child, myself," Nyberg told Parenting magazine. "I don't think I would be setting a very good example for my son if I were to give up on my dream." Karen Nyberg completed her doctorate in mechanical engineering at the University of Texas at Austin in 1998. That year, she joined NASA's Crew and Thermal Systems Division, working as an environmental control systems engineer on improvements in the space suit thermal control system and evaluation of firefighter suit cooling technologies. Nyberg will launch toward the space station with European Space Agency astronaut Luca Parmitano, Russian cosmonaut Fyodor Yurchikhin. They will join Russian cosmonaut Pavel Vinogradov, Russian cosmonaut Alexander Misurkin, and NASA astronaut Chris Cassidy as the crew of Expedition 36. Construction of the $100 billion orbiting lab began in 1998 and it has been permanently staffed with rotating crews since 2000. It is roughly the size of a five-bedroom house with a wingspan the size of a football field.